A file with the DAT file extension is usually a generic data file that stores information specific to the application it refers to. Sometimes you'll find them by themselves but often they're with other configuration files like DLL files. No specific program is responsible for creating or using every type of DAT file. A wide variety of applications use them as references to certain operations in their respective program. Since most DAT files are tucked away from view in an application's data folders, you'll probably see DAT files most often if a video file is being stored this way, or if you've received a malformed email attachment with the extension. Because DAT files are not as specific as most files, since the file extension doesn't immediately explain how to open one, you have to do a bit of digging. For example, an MP3 file immediately tells you that you're dealing with an audio file, a TXT file explains a plain text file, etc. The data behind a DAT file isn't so obvious. DAT files are unlike most other file types because, like mentioned above, they don't have an obvious program that opens them. Most types of files do. If you think the DAT file you have should be "opened" or "used" in a specific way, you'll need to figure out if it's text-based, video-based, an attachment, or some other kind of DAT file. Since you're not sure what program should be used to open this DAT file, your first try should be with a text editor. 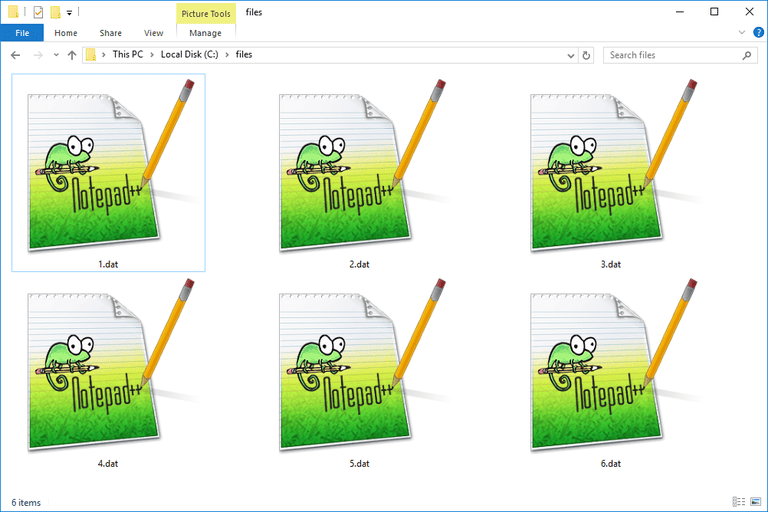 Windows Notepad is the basic text editor built-in to Windows but you can use something more advanced from our Best Free Text Editors list. In this example, you're able to see all the text in the DAT file and easily understand what it's used for. It's also obvious in this example that the file is associated with an Adobe program, hence the "Adobe" folder within the file's path (located in the title bar). However, other DAT files may not be text files — it depends entirely on what the DAT file is being used for. These types of DAT files may be locked files that aren't easy to delete, move, or edit. You'll probably only find a locked DAT file if it's a configuration file that's always in use by a program, like those found in the program's installation directory. These types of DAT files will probably never need to be manually opened or manipulated in any way. Some DAT files are actually video files that are saved from programs like VCDGear or CyberLink PowerDirector, among others, and can, therefore, be opened with one of those programs. The idea is to see where the DAT file is at on your computer. Just like with the Adobe example above, if the DAT file is in a program folder that appears to be linked with a CyberLink product, there's a good chance that it's the program that will open it. Again, most DAT files located in program directories on your computer are going to be rather useless because most (if not all) of it will be gibberish computer code. A DAT file you receive as an email attachment usually comes in the form of a winmail.dat or ATT0001.dat file. These types of DAT files are probably malformed attachments from a Microsoft email client like Outlook, Outlook Express, Windows Live Mail, or Microsoft Exchange. In this scenario, you should save the DAT file to your computer and either upload it to Winmaildat.com or import it into Winmail Opener to extract out the actual attachment. Klammer can open winmail.dat files on macOS. That attachment might ultimately end up being any other kind of file, like a document, an image, etc. DriveImage XML is an example of another program that uses DAT files for an entirely different purpose than all of the programs mentioned above. In this particular backup program, the entirety of the backup is stored in a single DAT file, accompanied by an XML file. This DAT file could in no way be viewed in a text editor, video editing program, or anything like that. Instead, because DriveImage XML is the creator of this particular DAT file, the same program is needed in order to actually use the DAT file. There are so many other programs that use DAT files, too. Bitcoin Core uses a file by the name of wallet.dat as the Bitcoin client wallet file. Minecraft uses a DAT file for a variety of purposes. Piriform applications store portability and registration information in DAT files. The Windows Registry uses DAT files to store hives and other registry information. Various programs that utilize Inno Setup use a DAT file to store uninstaller information. No doubt there are dozens or hundreds of others. Most files can be converted using a free file converter, but as you can see above, DAT files aren't like most files. The steps to convert a DAT file completely depend on the type of DAT file you're working with. There's really no reason at all to convert a DAT file to a different format if it's being used by a specific program to store configuration information, like in the first example from above. Converting that kind of DAT file to something else will probably render the file, and possibly even the program, unusable. DAT files that are video files can be opened in the video editing software that created it, and then exported or saved as a different format, likely ones like MP4, AVI, WMV, or FLV. See this list of free video converters for other ways to convert these types of DAT files. Remember the advice about winmail.dat and ATT0001.dat files several paragraphs above if an email attachment is the source of your DAT file. You can't usually change a file extension to one that your computer recognizes and expect the newly renamed file to be usable. However, in the case of a DAT file you received via email that you know is supposed to be, say, a Word document file, but it instead ends in the DAT extension, try renaming it to the correct extension and give that a try. For example, rename the DAT file to DOC or DOCX for a Microsoft Word file, JPG or PNG for an image, etc. Before you can rename a file extension, you'll have to make sure that Windows is configured to show them properly, which is explained here.